I didn’t start dropping down sidearm until after I hurt my shoulder in the 76’ brawl. I would only mix in to lefties though never righties. Would drop down on my slider and then my 2 seam fastball. They basically acted like two brand new pitches for me. The advantage for me, was the pitch broke more. It was also just another different pitch for me to throw to the hitter. Instead of my 12-6 curveball, it was now 9-5 movement to the hitter. Changing arm angles and slots is really usually a last resort type of thing. If your struggling then perhaps you should. For me the key to pitching is to be smooth. If you are smooth the ball will jump out towards the hitter. Nice, free and easy. You need to get rid of any taps or ticks that aren’t repeatable. 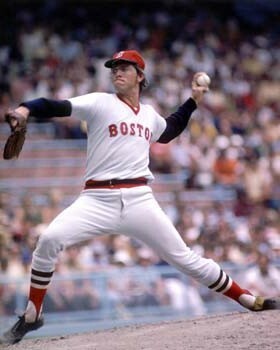 Robin Roberts reached the big leagues throwing nothing but fastballs, he was smooth as silk. All his fastballs weren’t necessarily the same speed. 2 seam-4seam, take a little off when needed. You have to be a dancer out there on the mound. I had many different pitches in my arsenal and I used all of them! I would mix up my rhythm to mess up the hitters’ rhythm. I would move fast down the mound then throw easy, then I would move slow down the mound and come at them hard. Always messing with them. Throwing strikes and working fast and your defence will stay behind you. Obviously in the big leagues I had some amazing defence behind me, great catchers which helps but learning to trust your defence and not do everything yourself will keep your pitch count down. Ultimately keep your arm healthier too with less pitches. Better level you play with better hitters you face, the better defence you should have behind you. Fastball, curve, slider and change up. I had a quirk in my body, I couldn’t throw the same pitch twice at the same speed. lol I threw 4 different pitches at 4 different speeds. I would add and subtract, I was basically pitching in 3 dimensions when most pitchers it’s just 2 dimensional. Lefties- that’s when I would drop down with my fastball or slider, but only really to very good hitters like a Rod Carew or Tony Oliva. Righties I would go sinker away but if they were starting to look away I would come inside with a slider and got a lot of groundball’s to third base. Win, lose or rain delay be happy you get to put on a jersey!